At Prime Minister Nawaz Sharif’s palatial offices in Islamabad this week, the army chief sat down to deliver the head of government a message he did not want to hear: The time for talks with the troublesome Pakistani Taliban was over. Sharif came to power a year ago promising to find a peaceful settlement with the Islamist militant group, but as round after round of talks failed, the powerful armed forces favoured a military solution. Their patience finally ran out and, late on Tuesday afternoon, during a tense meeting, the army effectively declared it would override a crucial plank of the government’s strategy and take matters into its own hands. “The army chief and other military officers in the room were clear on the military’s policy: the last man, the last bullet,” a government insider with first-hand knowledge of the meeting told a foreign news agency. The next day, Pakistani forces launched rare air strikes against militants holed up in the remote, lawless tribal belt near the Afghan border. It is not clear whether Sharif authorized the operation. On Thursday, they backed that up with the first major ground offensive against the Taliban there, undermining Sharif’s year-long attempt to end a bloody insurgency across his country through peaceful means. Disagreement over the militant threat is the latest row to flare up between the government and military, and relations between the two branches of power are at their lowest ebb for years, according to government officials. The government did say talks with the Taliban would go on. “We will talk with those who are ready for it and the (military) operation is being launched against those who are not ready to come to the negotiating table,” spokesman Pervez Rashid told local media on Thursday. But the operations put the military, which has a long record of intervening in civilian rule through plots and coups, firmly back at the centre of Pakistan’s security policy. The balance of power is shifting at a time when foreign troops are preparing to withdraw from Afghanistan, and arch-rival India has just elected a Hindu nationalist leader promising to be more assertive on the international stage. “This is the clearest signal yet that the army will dictate its terms now,” a member of Sharif’s cabinet said. The Pakistani Taliban, as distinct from the Afghan Taliban which is actively targeting NATO forces in Afghanistan, is believed to be behind attacks on Pakistani soldiers and civilians that have killed thousands in recent years. The Pakistan army has distinguished between “good” Taliban like the feared Haqqani network – who do not attack Pakistani security forces but fight in Afghanistan – and “bad” Taliban, indigenous Pakistani militants who are seeking to create an Islamic state. While Pakistan’s military wants to go after the “bad” Taliban, it has, despite pressure from Washington, largely avoided taking on groups who launch attacks against coalition forces in Afghanistan from Pakistan’s North Waziristan region. Prompting the latest intervention, the Pakistani Taliban have become increasingly bold, striking the army in tribal areas including a recent battle in which an army major died. Earlier this month, nine soldiers were killed in an explosion near the Afghan border. “We will avenge the blood of every last soldier. Talks or no talks, the army will retaliate,” said one military official, who, like most others interviewed for this article, spoke on condition of anonymity due to the sensitivity of the subject. The army has ruled Pakistan for more than half of its history. Sharif himself was toppled by the army in 1999 during his previous tenure as prime minister. But, humiliated after a secret 2011 U.S. raid that killed Osama bin Laden on Pakistani soil, the army stood back from politics and supported last year’s first democratic transition of power which brought Sharif back to office. 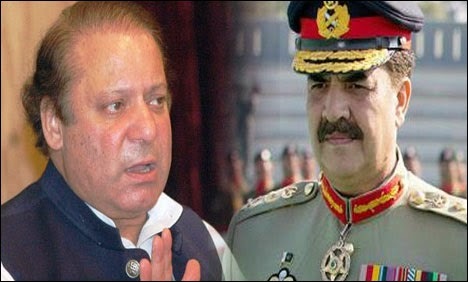 Sharif manoeuvred carefully, hand picking a new army chief and trying to forge a partnership with the military in the early days of his tenure, but the overtures had little lasting impact. There are other signs of civil-military discord. Sharif came to power promising to rebuild relations with India, but has been under pressure to toughen his stance from hardliners at home, particularly within the army. The nuclear-armed neighbours have fought three wars since independence from Britain in 1947, two of them over the still-disputed Himalayan territory of Kashmir. Sharif’s policies towards India have been heavily scrutinized; some in the army justify its hefty budget by pointing to – and, critics say, playing up – the potential threat from India. And despite signs the military has become more amenable to overtures from its old foe than in the past, a trade deal pushed by the prime minister and aimed at improving ties with India was cancelled at the last minute after pressure from the army, top government officials said. Sharif now faces a dilemma over whether to accept an invitation by Indian Prime Minister-designate Narendra Modi to attend his inauguration next week. The army is also bitter about the trial of former military ruler Pervez Musharraf, who ousted Sharif from power in 1999 and was arrested after he returned to Pakistan to take part in last year’s election. Ties with Afghanistan have never been easy, but some officials believe the army wants to torpedo the government’s relationship with a future Kabul administration, risking deterioration in regional security as NATO troops prepare to leave this year. Generals have jealously guarded the right to dictate policy on Afghanistan, seeing friendly guerrilla groups as “assets” to blunt the influence of India there. Though simmering under the surface, tensions between the government and the army spilled into the open last month when a popular journalist was shot by unknown gunmen, and his channel, Geo News, blamed the army’s powerful spy agency, the Directorate of Inter-Services Intelligence (ISI). Public criticism of the shadowy ISI is almost unheard of in Pakistan. In a rare public response, the army demanded that Geo News, the country’s most-watched news channel, be shut down. The government’s media regulator has since resisted the army’s demands to cancel the channel’s license, which the military sees as a direct sign of defiance. But despite putting on a brave front, officials say the government is feeling under siege.